Hankering for a side of fries? Try the grub at Ham Bones Restaurant, a Starke restaurant serving American-style fare. Gather up your group of friends and head to Ham Bones Restaurant, a local restaurant that has room for large groups. Fed up with difficult parking? 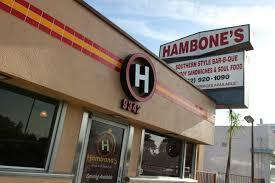 At Ham Bones Restaurant, you will find easy nearby parking and good eats. Your bill at Ham Bones Restaurant will typically run less than $30 per person, so bring the whole gang! When American food comes to mind, Ham Bones Restaurant should be your first choice.